This Hot stone massage online class includes a basic hot stone massage, a cool moonstone fascial, meridian tracing techniques, hot stone sports massage, for pregnancy, and restorative yoga and hot stones. Two full dvds of content. This 40 minute lesson shows how to perform the basic hot stone massage technique to the whole body. This includes how to perform layouts (stones under the body and on top), as well as massage techniques using the stones. Filmed in Santa Barbara on the ocean. Beautiful! This lesson shows how to use cool moonstones on the face to cool and calm the mind. The lesson shows how to use hot stones to trace the meridians. The indications for each meridian are discussed, then how to trace the meridian is shown. 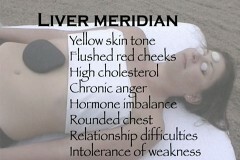 Includes the lung, bladder, spleen, liver and and kidney meridians. 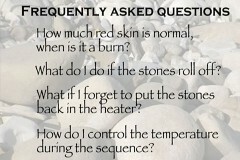 This lesson covers some common misconceptions and frequently asked questions regarding stone massage. More introduction and review about the guidelines and principles of advanced stone massage. 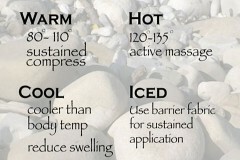 How to use hot and cold stone massage to deal with injuries. This includes shoulder and knee pain. This shows how to use hot stones in the side posture, and discusses contraindications. This lesson includes more work on the meridians with advanced stone technique, including more layouts, rolling and specific points. This shows how to position your client in various restorative yoga postures on the table, and how to incorporate hot stones with the postures.